Regular registration for the Colloquium has been extended to May 16th - Join the Church Music Association of America in St. Paul, Minnesota June 19-24, 2017, for the 27th Annual Sacred Music Colloquium. What is it that makes the CMAA’s Sacred Music Colloquium different from other conferences? So many things... perhaps I should mention a few things about CMAA Colloquia that are hard to understand unless you’ve attended one. The Colloquium is a teaching conference. It is an intense 6-day event where you can learn things you can’t learn anywhere else. You’ll see, experience and participate in liturgies that will amaze you. You’ll hear world-class organists, sing under the direction of truly gifted directors -- directors who will inspire you to greater skill in your singing than ever before. 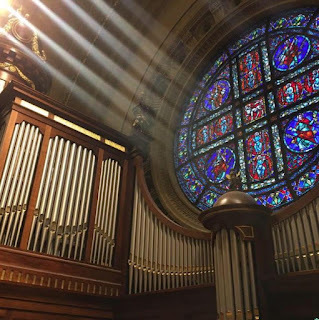 At our breakout sessions you can choose to learn more about topics that are of specific interest to you, including information on training children, semiology, chant modes, breakouts for organists, parish programs, composing new music and many more. When you attend a Colloquium, you have the opportunity to sing in two choirs -- one polyphony choir and one chant choir. Whether you are an experienced singer or a relative novice, there are suitable choirs for you. For example, If you already are a skilled “square note” singer, you can learn more about the subject by digging in to chant direction or improvisation. If you are a novice at chant notation, you can get the rudiments during the week and be singing at liturgies before the week is done. In some ways, the week can be a spiritual retreat - daily Mass, confessions, sung Divine Office. Also, it is a chance to recharge your batteries with the helpful encouragement and camaraderie of the other participants, inspired to return home with a plan to make the sacred music at your parish more beautiful. The beautiful liturgies can help to create a new mental image for you to imagine what we strive to reach in our own parishes and cathedrals. While we realize that few parishes will have such a concentration of musical talent as we see at a Colloquium, the experience will change you. If you haven’t yet made the decision to join us in Saint Paul this summer, decide now to come to Saint Paul and be inspired.